We highlight our favorite CES smart home gadgets we are looking forward to exploring in 2019. Every year after we attend CES, everyone wants to know – what was the best thing you saw at the show? Smart home gadgets are now so popular, it is hard to pick just one. Affiliate Disclosure: This page contains links that may earn us a commission from Amazon Services LLC Associates Program. Opinions and conclusions are our own. After a week of reflection we were able to get it down to a short list of 29 smart home gadgets we are looking forward to seeing in production over the next year. We have organized them into the same categories we use for our smart home devices. Did we miss your favorite product? Anything else you are curious about from the show? We’d love to hear from you in the comments. The Mixtile smart home hub can connect to and control hundreds of compatible smart home devices locally within your own home, even when the Internet is down. It stores and encrypts your personal data right inside the hub, giving you additional protection over your data and privacy and includes a backup battery that lasts up to 10 hours, so you can still control your battery-powered home devices even if the power goes out. We’ve long been fans of local device control and are happy to see another company taking this seriously with a new, easy-to-use smart home hub. Mixtile was funded originally through Indiegogo and is available through their Indemand site or on Amazon. RoomMe Sensors for Room-Level Automation. Click to see our YouTube Video. Wouldn’t your smart home be even smarter if you didn’t need to pull out your phone or ask Alexa to turn things on when you arrive home? What if you and your partner like different lighting, music and room temperature? Add RoomMe’s presence sensors in rooms around your house to personalize your smart home experience for each member of your family. It connects directly with your smart home, but you do need to carry around your phone with you for it to work. Watch the video to see how it works. Viaroom Self-Learning Home. Click see our YouTube video. Now that everything in your house is connected, shouldn’t your devices start working together without your help? Viaroom Home is working to solve this problem by using artificial intelligence to learn about how you use your home then directing your devices to control them for you. Just install the Viaroom device and wait a week as it learns your patterns. 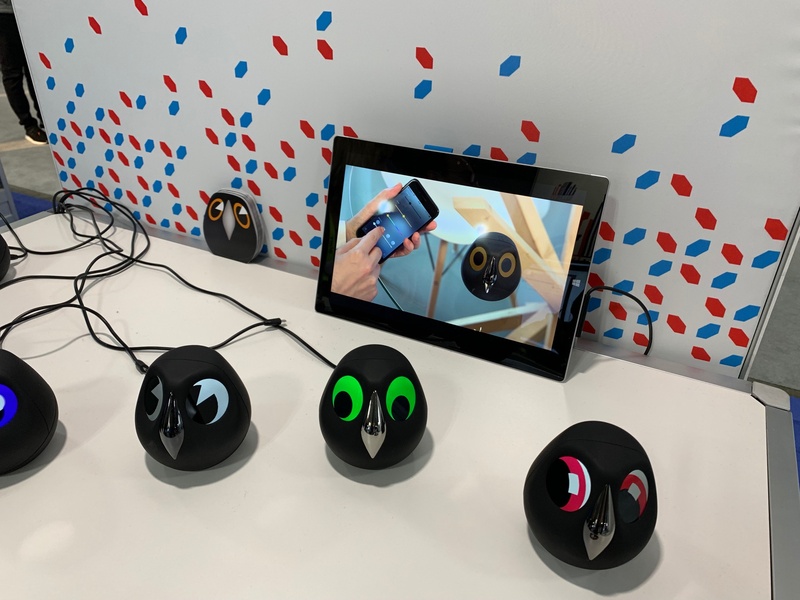 We aren’t sure exactly how this will work out, but we think devices like this that attempt to provide collaborative AI will free us from having to script everything ourselves. Watch the video to see how it works. We all love our televisions but when we’re not watching them, they take up a lot of space in our house with a big, ugly, black screen. 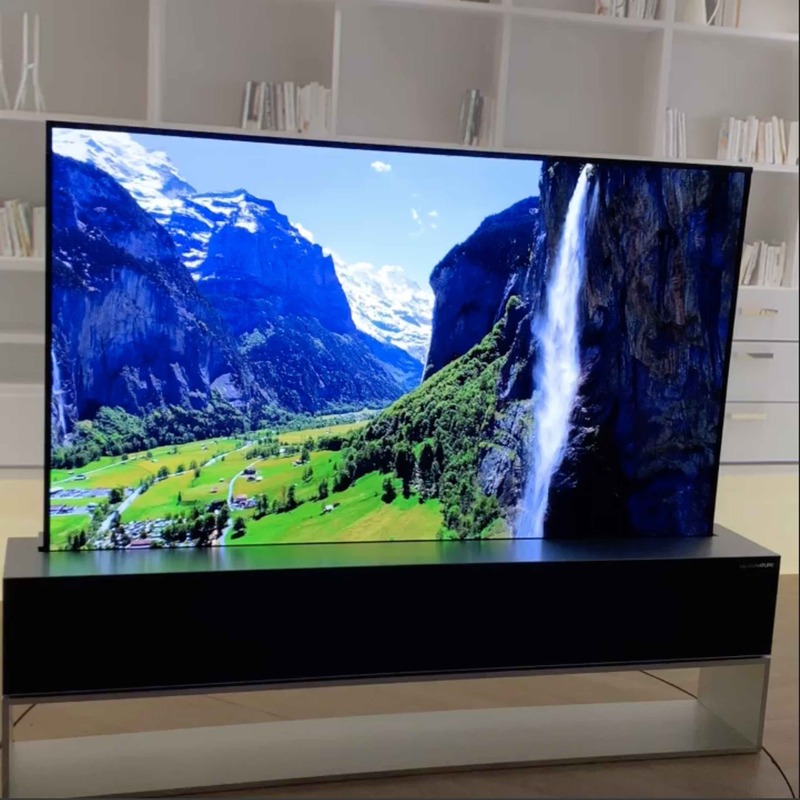 The LG OLED TV R is a beautiful 4K, OLED TV that rolls up quickly and quietly when you need it, and rolls down into an elegant piece of furniture when you’re done. It already includes Google Assistant and will add Alexa and AirPlay 2 support later this year. The new OLED TV R should be available in retail sometime this spring. Every time you and your family use the Internet you could unknowingly be sharing all your personal data with hackers, spies, government agencies and corporations. Winston Privacy have created a device you can attach to your network to easily protect your identity and speed up your network and your browsing in the process. It’s available for pre-order now with one year of free service. Watch our YouTube video to see how it works. When you’re cooking meat in your oven or on your grill, using a temperature probe helps you cook it perfectly every time. Connected temperature probes have been around for years but they usually have wires that connect to a base unit, which can get tangled, disconnected or lost. MEATER solves this with a completely wireless thermometer that connects to your phone via Bluetooth. You can use a MEATER by itself and monitor the cooking temperature up to 33 feet away by line of sight, or add the MEATER+ as a repeater and see how your meat is doing up to 165 feet away. It’s small and sleek with all the electronics and the battery in the top. You can buy the Meater, Meater+ and a 2-pack of Meaters on Amazon today. Fromaggio with cheese samples. They tasted great! Love cheese? Now you can make your own at home right in your own kitchen with the world’s first smart home cheesemaker. With the Fromaggio, you can have fresh mozzarella just the way you like it in about 30 minutes. Talk about taking your pizza to the next level. We’re hoping it will be ready before the holidays this year. Order now through their kickstarter campaign. GE Appliances’ Profile line of home appliances now has a center of attention – the 27-inch integrated touchscreen and range hood combo – the Kitchen Hub. You can browse recipes, watch movies and control your smart home all from one console. There are some other great smart ovens out there, but we love that the Kitchen Hub is at eye level and includes collaborative AI features with other smart home products. It’s even smart enough to turn off your GE Smart range if your Nest Protect detects smoke. GE plans to launch it this May. Watch our video to see the CES demo. KitchenAid’s new Cook Processor Connect is an all-in-one machine that can chop, stir, steam, knead, whip, boil, and fry to help home cooks prepare their perfect meal. It connects to an app and will include 100 preset recipes. We love all the amazing features, the KitchenAid durability and the potential for complex meals with easier clean-up. Watch our video on YouTube to see how it works. Samsung’s Family Hub with its beautiful full-length screen is much more than a just a refrigerator. It will identify the food inside with the included camera, suggest recipe ideas incorporating those, then coordinate with your Samsung oven to turn on and set the cooking time. You can even control your smart home, with thousands of devices supported, from the built in SmartThings hub. Watch our video to see the Family Hub in action. Smart refrigerators have been around for a few years but if you are like us you probably already have a fridge that doesn’t need an upgrade yet. If you want to be able to look inside to see if you need eggs or milk right from the grocery store and help reduce food waste, you can install one or more Smarter FridgeCams that will take a photo inside everytime you close your fridge door. With the Smarter App, you can add to your shopping list, keep track of items ready to expire, and integrate your fridge with your Amazon Echo. It’s currently shipping in the UK but will be available in the US soon. We all have switches and outlets all over our home to control our lights and devices. Here at AppMyHome we have changed a lot of ours to add smart home connectivity, USB outlets, and nightlights. Swidget takes this one step further with modular, adaptable smart home outlets that allow you to customize your home even further. You can add control with Z-Wave, Zigbee, or Wi-Fi as well as temperature, motion, humidity sensors, or even Alexa and aromatherapy. It’s a great way to automate your house by adding sensors and features in the outlet instead of extra sensors with batteries or separate devices. Outlets and inserts are expected to begin shipping by March 15 this year. Zooz Z-Wave smart switches, dimmers and outlets are built with years of practical experience from the experts at the Smartest House. While all their products are great, we are most excited about their S2 Double Plug, a plug-in smart outlet that allows you to control two outlets via Z-wave Plus and provides a bonus USB socket. With the slim design you can actually plug in two of these to an existing outlet providing you with four outlets and two USB ports. It’s available now on the Smartest House website. Watch our video to learn about all their products at CES. Legrand switches with embedded Alexa. Legrand has long sold their beautifully-designed products through custom installers. Now they have integrated their European and American divisions and will now be offering DIY products here in the USA. They announced two new elegant switches with built-in Alexa voice assistant, the Living Now control unit and the Celiane with built-in Amazon voice assistant. The Legrand products are well built and the back that goes inside the wall box is much smaller than most the other smart switches we’ve seen. We are looking forward to testing these out once they’re released. Kwikset has been one of the industry leaders in smart locks for some time, and AppMyHome has reviewed the Kevo, Kevo Convert and the Obsidian Lock. This year Kwikset added the Halo line of Wi-Fi connected locks. Now you can easily add a smart lock to your home without having to use a separate hub to lock and unlock it remotely. The Halo connects to your home’s Wi-Fi to immediately give you access to your house from anywhere in the world. They claim the battery life is good, we hope so since changing the batteries in our smart locks is a pain. The HALO smart lock is coming soon. Watch the video to learn more. Most of us have smoke and carbon monoxide detectors in our home but there are lots of other potentially dangerous things in our air that we can’t see. For instance, Radon is the number one cause of lung cancer amongst non-smokers, killing approximately 21,000 people every year in the US alone. Last year Airthings introduced the Wave, their smart radon detector, and this year they are adding the Wave Mini to monitor other gasses, with smaller devices you can put in more rooms around the house. You can see your air quality in real-time in the house with the AirThings App, or from anywhere in the world with their hub with Airthings smart link. Both the Airthings Wave Mini and the hub are coming soon. Watch our video to see how it works. We saw the Shepherd lock on our last day of CES in Eureka Park. We thought it was just another smart door lock but we learned these are the folks from Detroit that brought us the smart key fob that starts and locks your car. The Shepherd Lock can be added to any deadbolt to enable touch-to-open. Plus it’s really fast and quiet. It even has a tamper proof feature that will prevent the lock from operating if someone attempts to pick it. They plan to start accepting pre-orders via Kickstarter in March. The Minut Point is an easy-to-install all in one alarm system for your home that detects lots of potential threats without cameras. The Point sensors detect motion, temperature, humidity, sound or tampering and uses smart analysis to recognize problems, like breaking glass or screaming, and alert you, your loved ones and/or your neighbors of issues. For a small home or an apartment, just one Point will cover you, making it ideal for second homes or rentals. It comes with one year of Premium service but it will also work without an additional subscription. We think this is a great simple solution for all homeowners who want security but especially for apartments and condos. It’s available today on Amazon. You can add these Wi-Fi connected safes to your house to add more protection for your valuables. The Bolt mounts on a wall and the Flex can install without tools into a shelf or other safe space. If someone tries to forcibly open the safe you will get an alert on your phone, plus, to discourage the thief, it will play loud and bright alerts. You can remote open it from anywhere or use a backup key for emergency access. While it is not recommended for really dangerous items like guns, it is a great solution to give you an extra level of protection for valuable things at home. The Bolt and Flex are expected to ship in April 2019. One of the primary reasons we installed a video doorbell was so we could see when and if we get packages delivered. Finally, someone has created a video doorbell with two cameras – one pointing at eye level to see people coming, and another pointing down to see packages. Maximus claims higher resolution and faster time to view live visitors. The app shows the two video streams simultaneously so you can see both angles. Maximus expects the doorbell to be available to buy in three to five months. Watch our video to see how it works. Wyze Cam makes great, reliable and inexpensive smart home cameras that don’t require a cloud subscription. By connecting the MaxDrive, you will be able to get long-term storage of your videos and keep it inside your own home. You supply the actual disk drive, 3.5” or 2.5” hard drive or a solid-state drive. The MaxDrive uses a wired ethernet connection (not Wi-Fi) to ensure a solid and hack resistant interface. Using you own drive means you can swap drives easily in case you want to archive the data. Plus, since the MaxDrive is basically a Network Attached Storage system, you can use it to connect and store your photos and video and any other files in your own home as well. The MaxDrive will be available later this year. Watch our video to see how it works. Ring has made smart doorbells feasible for the millions of people who live in apartments or condos with a peephole smart camera. We looked through the camera and the view was crystal clear. If the recording is as good as the view this will be a great option that keeps the camera inside the house. Ring plans to release the Door View cam later this year. It’s great to have cameras in your home to keep an eye on things, especially your kids when you aren’t home. But regular cameras are not always very attractive and are sometimes just creepy. The Ulo cameras are downright cute, with expressive eyes and the lens hidden in their shiny beaks. Put one or more around your house and you are sure to get regular smiles. Just make sure you’re not worried about the budget as we were a bit surprised by the price. ZModo took the relatively simple concept of automating your yard hose bib and make it three times as smart by adding three different controllers. You can program one, two or three independent schedules to fill your fountains, water your lawn or garden or turn it on manually right from the device when you need it. Coming soon! Watch our video to see the Flow and other Zmodo smart home products. There are about 10 deaths a day in the United States from unintentional drowning. Depending where you live, if you have a backyard pool you may also be legally required to install safety devices to help prevent these tragic accidents. The Coral Manta drowning detection system uses underwater video surveillance and artificial intelligence to alert you to potential emergencies inside your pool, all powered by solar. Coral Manta uses computer vision and artificial intelligence to track everyone in a swimming pool and detect drowning risk. It’s solar powered and they claim can protect your pool 24/7. It’s available now and ships within two to four weeks from their website. Watch our video to learn more. Have you ever wished you could see through walls? Well now you can. The Walabot DIY lets you see within the walls of your home to detect pipes, studs, wires, or even animals that may get in the way of your home improvement project. Pair the Walabot with an Android phone, but not an iPhone, and you can see up to 4 inches behind your walls. Even though we don’t have an Android phone we think it would be worth picking up a cheap model to use this, as we won’t need a separate phone plan, just Wi-Fi. You can buy Walabot DIY today on Amazon. Watch our video to see how it works. The Flo by Moen can keep track how much water you use. Click to see our YouTube video. The Flo by Moen is an in-line security system for your home water. It monitors your water system and can automatically turn off the water if it detects a leak. It uses water pressure and some AI to look for problems. This is very handy if you have a slow leaking toilet or a leak in the wall. And if you’ve ever wondered how much water you use in the shower or how many times a day you use the toilet, it will tell you that too. It is a great way to protect your home from leaks and conserve water at the same time. Watch our video to see how it works. Palo Alto Innovations’ Sandman Doppler is the next version of their popular Sandman Clock. The Doppler includes Amazon Alexa and Google Assistant integration, high-quality stereo speakers and six high-powered USB ports (either 6 USB-A or USB-C or 3 of each) and will be available in Spring 2019. We first saw the Doppler at CES last year and look forward to trying it soon. Watch our video to learn more. Shadecraft announced its original Sunflower autonomous sun umbrella with much fanfare at CES 2017. This year they announced the Bloom, a controllable backyard parasol automation device for the rest of us, including a stereo speaker with built-in Alexa. You can either add the Bloom to many existing crank or pulley backyard umbrellas or, if you pre-order soon, you can get it with a parasol included. We hope you have enjoyed our favorite CES smart home gadgets. While some of these are available to buy today, many others will be coming later this year. Subscribe to our newsletter to learn more about these and other smart home products throughout 2019.